At least seven people have died with more missing after wildfires across several states in central U.S. have consumed million’s of acres. Wildfires have wiped out 650,000 acres in Kansas this week devastating farms in the area. The fires are thought to have killed nearly 10,000 cattle, many of them calving (which could actually double the amount) in the Kansas alone. The fires have been helped by low humidity and heavy winds, conditions that have made the Kansas Plains a tinderbox. 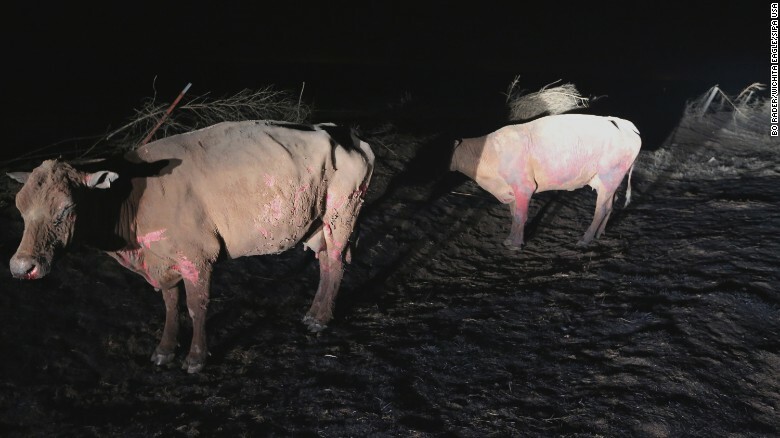 The devastation doesn’t end there, not only have the farmers lost an unknown number of cattle, but the livestock that have survived have no grass or hay to feed on, most of it having been consumed by the flames. With more than a million acres burnt it has left the land looking like a moonscape and to make matters worse there is 100,000 miles of fencing burnt. Firefighters have contained a grass fire that destroyed four homes and left about 200 head of cattle dead on the plains of northeastern Colorado. Logan County spokeswoman Marilee Johnson says crews completed containment lines around the fire on Wednesday but were still working to extinguish hot spots, including hay bales.